Last week we talked about the story of Mary and Joseph and the child Jesus fleeing to Egypt to escape King Herod as recorded for us in the book of Matthew, and later, after King Herod has died, they return to Israel and live in the town of Nazareth in Galilee. Here, we are told, Jesus “grew and became strong, filled with wisdom, and the favour of God was upon him,” as recorded in Luke 2: 40. Then, in the very next passage, we’re told the story of the twelve year old Jesus at the temple in Jerusalem in his “Father’s house,” he says. And we know by “Father” that Jesus means God, implying that God is his Father. 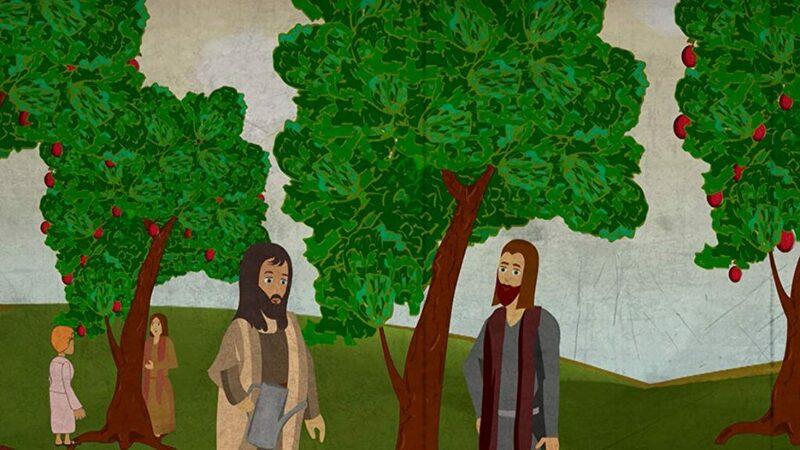 We have just this one little glimpse of a story of Jesus as a child or young person. Have you ever wondered about Jesus’ early years? Where are the other stories about his life? What was he like growing up as a little child, a young person? Where are these stories, and why don’t we have more of them recorded for us in our biblical scriptures? Well, we don’t. But there are other ancient texts and scriptures. There is an ancient work called The Infancy Gospel of Thomas written, as claimed, in the second century A.D. This Thomas is not the disciple of Jesus – it is another person called Thomas. There are very old versions of this work written in Syriac, Greek, Old Latin, and Ethiopic (Ethiopian). Translations of this work date from the 11th century. In this work The Infancy Gospel of Thomas there are stories and legends about the child Jesus. It tells of Jesus at five years old playing in a stream, gathering the water into pools, purifying them, and taking clay from the mud, he forms twelve sparrows. Then, with a shout, he commands the birds to “Go, take flight, and remember me, living ones!” Did this really happen? Or is it a fable? There are other stories: Jesus is playing on the roof of a house with other children, and a boy falls off the roof and dies. The boy’s parents come running and accuse Jesus of knocking him over the edge, but Jesus says he didn’t, and he quickly goes down and stands beside the dead boy’s body, saying: “Zeno, Zeno, rise and say if I knocked you down.” The boy gets up and says: “No, Lord,” and the parents and townspeople are amazed for this wonder. There is a story of Jesus going into the forest to gather sticks with his brother James, and a poisonous snake bites James, who sprawls out on the ground dying; Jesus blows on the bite, immediately the bite is healed, James recovers and the snake is destroyed. Are these fables or did they really happen? There’s a story of eight year old Jesus working a miracle in Joseph’s carpenter shop. Joseph is making a bed and one length of wood is shorter than another. Joseph is distressed because they are meant to be the same length, and young Jesus takes hold of the shorter piece and stretches it to match the longer piece. Joseph is overjoyed. Did this really happen? There are stories about Jesus correcting his school teachers and teaching them about the alphabet letters and the true meaning of Alpha and Omega – the beginning and the end. He astounds his teachers – they are stupefied and “cannot follow along in their minds,” we are told. 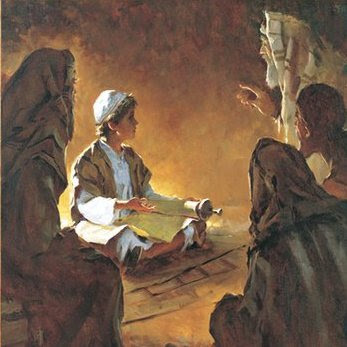 One teacher is said to say: “This child is something great, either a god or an angel or whatever else I might say – I do not know.” We’ve read in our scriptures this morning about the twelve year old Jesus amazing the temple teachers in Jerusalem with his understanding and his answers. Are these other stories true, or legends, or fables? Religious scholar William Barclay, greatly revered for his work and study, shares two legends in his commentary The Flight into Egypt. The first story tells that when Joseph and Mary and the infant Jesus were fleeing to Egypt, they were met on the road by a band of robbers who wanted to kill them and take their goods, but one robber called Dismas, looks at the child Jesus and sees something there which stops him – he persuades the other robbers not to harm the family and let them go. Dismas, according to the legend, is one of the two robbers dying on his cross with Jesus at Golgatha – the one who asks Jesus to remember him in his kingdom. The other legend is again, about the holy family fleeing into Egypt to escape King Herod’s soldiers, and the story relates that evening comes and Mary, Joseph and Jesus seek shelter in a cave. A spider spins a large web across the entrance, it is cold, and the web becomes covered with white hoar frost. When a detachment of Herod’s soldiers comes along the path searching for male children 2 yrs and younger to kill as they carry out Herod’s orders, the captain sees the cave but says: “Look at the spider’s web – it is quite unbroken – there cannot be anyone in the cave, for entering they would have torn the web.” The soldiers pass by and leave the holy family in peace. And that, so they say, is why to this day we put silver tinsel on our Christmas trees, a reminder of this legend when the spider’s web saved the holy family. Did these legends and stories really happen? Jesus increased in wisdom, in years, and in divine and human favour our scriptures tell us, and Mary the mother of Jesus “treasured all these things in her heart.” It is recorded that at the wedding feast in Cana, Jesus’ first public miracle to begin his adult ministry, it is mother Mary who says to the servants, “Do as he says,” and the water is turned into wine. Mary knows what Jesus is capable of doing. I’m sure she saw many wonderful things with the child Jesus growing up in her care which are not recorded for us. In John 21: 25, the disciple John states: “Jesus did many other things as well. If every one of them were written down, I suppose that even the whole world would not have room for the books that would be written.” In faith, we believe that Jesus did amazing things. Things that would astound us. And like his mother Mary, we would treasure them in our hearts. In my theological studies, we were taught to read the scriptures as if looking through a lens – look beyond the words, try to grasp the meaning or context or setting beyond the mere words, and try to capture the larger picture. What is happening in the story? What do we see? What we do know looking at the life of Jesus is that his life was exceptional, filled with wonder and the grace of God. The wisdom of God. Jesus repeatedly astounded people with his teachings and insights. Where did a simple 12 yr old boy get the kind of knowledge to astonish the religious teachers in the Jerusalem temple? We find him sitting among the teachers, we are told, “listening to them and asking them questions. Everyone who heard him was amazed at his understanding and his answers,” Luke 2: 46, 47. Where did Jesus get this knowledge? If we believe he was Immanuel, God with us, the “Son of the Most High” as the angel Gabriel tells Mary, then it is understandable where he gets his knowledge, isn’t it? Gabriel says: “So the holy one to be born will be called the Son of God,” Luke 1: 35. Jesus, the Son of God, is conversing and communing with God his Father all his life. Jesus speaks the language of God, the words of God, and conveys that Godly knowledge to all he meets. Has the life of Jesus touched you? Have you experienced his presence? Has Jesus answered prayer for you? Have you called on him for help or guidance in some way? Have you felt him near? Perhaps you have experienced something profound, something unexplainable? Has Jesus intervened for you in some way? We celebrate Jesus coming to us, his birth in Bethlehem, but more than that, we celebrate his Spirit with us today, always. And if his Spirit full of the knowledge and wisdom of God was available to all those in his company when he was growing up as a child and as an adult, why would we think it was for them only and not for us today? That Spirit of Jesus is alive for us in our present day just as it was for all those who were in his company so long ago. Jesus is “the same yesterday and today and forever,” we are told in Hebrews 13: 8. Jesus hasn’t changed. His Spirit is the same. Is he with you? This new year of 2018, may we all more fully discover that incredible, inexplicable, sensational, unboundable, miraculous and liberating Spirit of Jesus. May it come alive for all of us this year. May we sit at the feet of Jesus, listening and learning and gleaning his insights and knowledge for each one of us. May we each of us be truly blessed to learn more of him, more about him, and may we become more like him. May that be our prayer for this year, to grow into the knowledge and wisdom and love of Jesus our Lord and Saviour. And may we be amazed, astounded, and savour the special moments we have with him, treasuring them in our hearts. Amen.